From plugging a single tube, to the removal of deposits by chemical cleaning, to rebuilding units from the ground up, Quintel offers heat exchanger repair services to suit each customer and situation. Our 25-plus years of experience in the reconditioning and repair of heat exchangers is on your side when it comes to performing quality work on your vital equipment. Our work also provides the same warranties as would apply to equipment direct from an OEM, and our customers can enjoy them at a fraction of the cost. And should repair of your heat exchange equipment not be the most cost-effective solution in your case, we will be the first to tell you. Every unit that leaves our shop is guaranteed against leaks. A full set of NDT procedures are performed as appropriate to each vessel, including air testing of the tubes and the complete assembly, a vacuum test, a hydro test, as well as an inspection by borescope to detect corrosion. Our chart recorders ensure that test results are saved and can be utilized in preventative maintenance evaluations. All test results (along with the unit history) and any videos/DVDs produced will be supplied to the customer for their records. 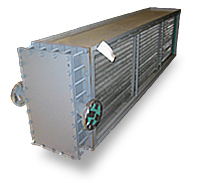 As ASME-code heat exchanger repairers, our shop carries an R stamp, certifying our shop in the repair of and/or alteration of those pressure vessels, as well as boilers, and other pressure-retaining items. 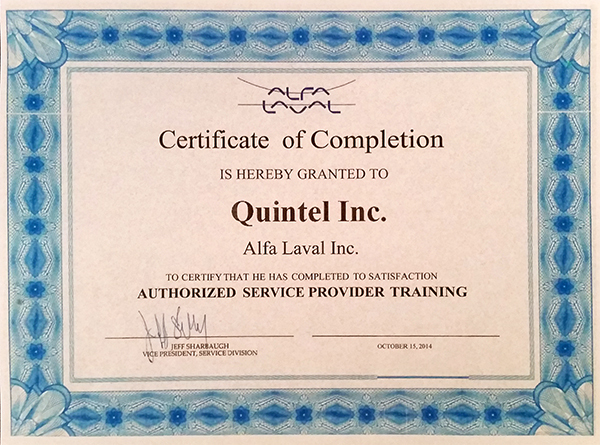 Quintel is also an Authorized Service Provider for Alfa Laval Inc., one of the leading global providers of Plate Heat Exchangers. They are characterized by their compact design and high thermal efficiency. We have completed detailed training in the techniques used to properly restore Alfa Laval Exchangers and have many years of experience working on all different types and sizes of these plate/frame exchangers. As a certified provider of Alfa Laval exchangers, Quintel is able to offer new exchangers or existing exchangers that have been restored to new condition. So, whether your situation calls for a heat exchanger retubing, a heat exchanger air or water cleaning, an ultrasound cleaning, or a complete heat exchanger rebuild, contact us to get the job done right. 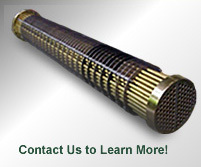 Request a quote today on your heat exchanger repair needs. If you have further questions, don’t hesitate to contact us.